Lakewood Yacht Club members Chris and Karen Lewis, who have been competing on the East Coast this summer with their 44’ J-44 Kenai, won their IRC Class and took the overall IRC victory to win the Vineyard Light Ship trophy over Labor Day weekend. The Vineyard Race, hosted by Stamford Yacht Club in Connecticut, was the 82nd running of this 240-mile event. Viewed by many as the most challenging offshore race, with segments in Long Island Sound and the open Atlantic, as well as two crossings of tidal races that mark the boundaries between sound and ocean. The trophy memorializes the Vineyard Light Ship that sunk in September 1944 with all hands on board during a hurricane. Sailing with Chris and Karen were local sailors David Hinrichsen, Emmett Dickheiser, Pedro Gianotti, Alex Freas and Reed Cleckler. Two East Coast sailors, Alec Snyder and Gurhan Ozen, were also onboard. During the passage out of Long Island Sound, they picked the wind changes as it swung from the gradient northeast breeze to a thermal breeze and finally a south easterly. At Vineyard Beacon turning mark, Kenai was lying 6th rounding with much faster race boats. At the finish after a 120-mile spinnaker leg home, charging in at up to 12 knots in a building breeze created by Hurricane Hermine, they corrected to finish 11 minutes faster than 2nd place Vamp, another J-44, after a 33-hour race. Vineyard Race photos were provided Courtesy of Photo Boat. Earlier this summer Kenai won the Rolex Cup participating as a two-boat team with fellow LYC boat Leading Edge owned by Tom and Diane Sutton. 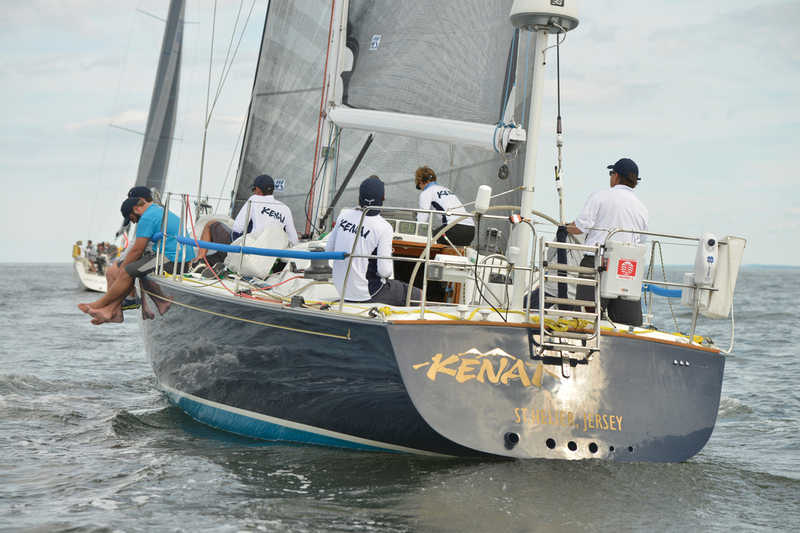 Kenai also won IRC Classes in the Around Conanicut Island Race and the New York Yacht Club 162nd Annual Regatta and finished third in Class in the 50th Newport-Bermuda Race; making her Runner-up overall in the Onion Patch Series. Chris and Karen, who first joined Lakewood in 1996, have owned Kenai for 20 years and over that time improved the boat to make her more competitive. The most recent change being the addition of a 1.5m sprit and giant 175sq m spinnakers. She has a modern sail inventory furnished by the local sail lofts North, Quantum and UK Halsey Sails. In October the Lewis’ will sail south to compete in SORC events which may now include a Jamaica to Cuba race to be run after the Pineapple Cup from Miami to Montego Bay.